The Could and star Stickers is a modern decoration that combines design with infinitely sweetness. Stars and clouds have always been a must-have for decorations of children's rooms. They are also the stars of the Could and star Stickers by French brand Lilipinso. Different from usual, in this case the stars and clouds are presented in an original form that will astound and amaze every child. From a large and fluffy cloud hands a long wire adorned with bright stares and tender flakes. A truly unique decoration of its kind by Israeli designer Michal Marcho, which adorns your little one's room with a delightful detail, one that can shower the entire environment with serenity. The adhesive is made from matte vinyl and comes on a card from which you can cut it out, taking off the protective film and apply it directly to the wall. Choose your favourite place to place it: next to the bed, on either side of the window, at the center of the wall. There are truly no limits to space with imagination and the Cloud and Star Stickers will always provide a sweet view. You can also decide to use a single wire, or apply many stars, vertically or horizontally, to decorate every corner of the small room. Safe to use, designed specifically for childhood, no dyes or harmful substances, this wall sticker is ideal to accompany boys and girls as they grow, adding serenity when it's time to say "goodnight" and adding some colour to "good morning". 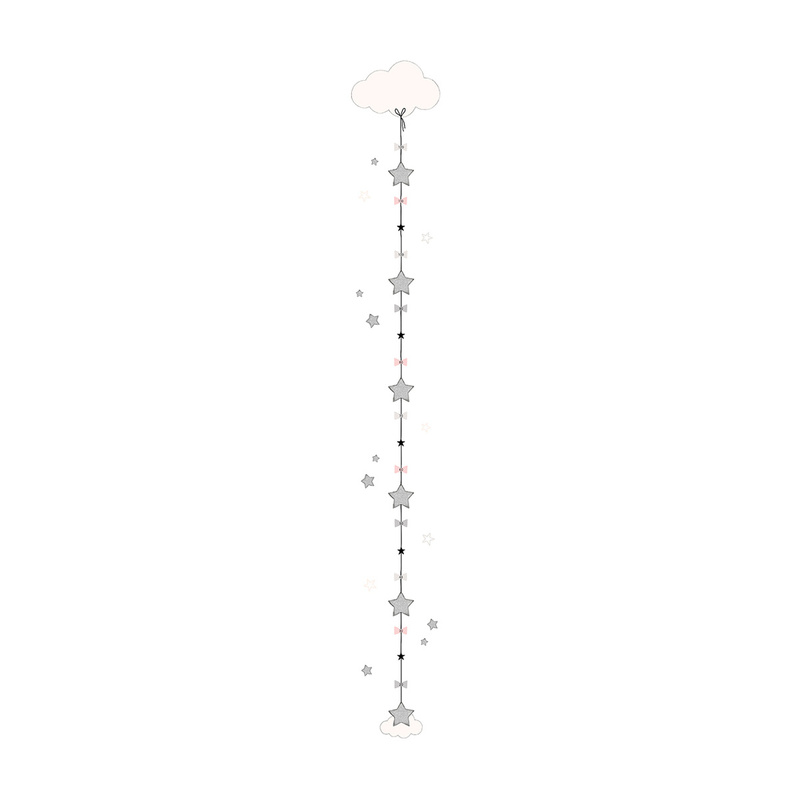 The shapes and colours have been designed to make the atmosphere peaceful; the stars and the silver powder pink details are a perfect mix to instill calm in even the most restless of children. In addition, applying these stickers will also be fun for the baby's parents: they don't damage the wall, stick to any smooth and dry surface, and are easily removed without leaving a trace, even after having been on the wall for a long time.